Diego Costa has been charged for violent conduct after an alleged stamp following the Capital One Cup semi-final with Liverpool on Tuesday. 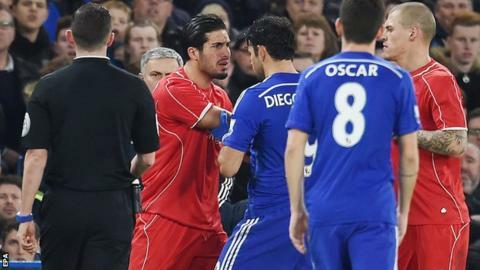 The Chelsea striker, 26, faces a three-match ban for his challenge on defender Emre Can during the 1-0 victory. The Spaniard could miss Saturday's league match with Manchester City at Stamford Bridge if he is found guilty. He has until 18:00 GMT on Thursday to respond to the Football Association's charge. He is being charged for the first of two alleged stamps that were not seen by referee Michael Oliver. He also appeared to stand on central defender Martin Skrtel in the Liverpool penalty box in the second half. Reds manager Brendan Rodgers said at his post-match press conference: "He could easily hurdle over the young player and he directs his studs right on to his ankle, which could've been nasty." Chelsea boss Jose Mourinho said after the game that he feels the Brazil-born Spain international is being targeted unfairly. The Blues, who won 2-1 on aggregate, will face the winners of Wednesday's second semi-final involving Tottenham or Sheffield United, in the final at Wembley on Sunday, 1 March.